Jon Favreau has managed to assemble an impressive roster of talent for his upcoming The Mandalorian series for Disney+. But perhaps the most intriguing bit of casting was Werner Herzog. Although Herzog has acted plenty of times throughout his career, he’s primary known for his work as a writer and director. His role on The Mandalorian has been kept under wraps since his involvement was announced back in December. However, Herzog himself provided some new clues during a recent interview with IndieWire. Apparently, he’ll have a minor presence as an antagonist on the show. 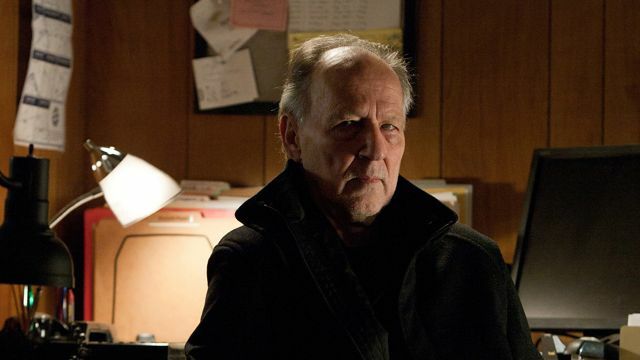 Herzog is certainly capable of assuming villainous roles onscreen. He previously appeared in 2012’s Jack Reacher as The Zec, who menaced Tom Cruise’s title character. Now, it looks like Herzog will bring a similar wickedness to The Mandalorian as he faces Pedro Pascal’s bounty-hunting protagonist. But if his part is indeed a small one, this prompts us to ask more questions about the nature of his character. We already know that Pascal’s gunfighter will also be squaring off against IG-88 during the first season. With this, it’s possible to theorize that Herzog is playing a crime lord who’s scrambling to hold onto some semblance of power after the Galactic Empire’s fall. In order to achieve this, he might be recruiting bounty hunters like IG-88 to do his dirty work. Currently, Herzog is making the rounds promoting his new documentary, Meeting Gorbachev. The film, due out May 3, depicts one-on-one interviews between himself and former Soviet Union leader Mikhail Gorbachev. The Mandalorian is still without an official premiere date. Do you have any additional theories about Herzog’s character? Tell us what you think in the comment section below!